I always say I’m more of a food enthusiast than a cook, but hear me out! There are two core challenges I have when it comes to cooking: buying the right ingredients and wasting food. I simply don’t have time to plan meals or browse every aisle of the grocery store. Buying excessive quantities of ingredients is not only expensive but also a huge waste. HelloFresh is the perfect solution for busy people like you and I struggling to find the time to enjoy delicious and homemade meals. 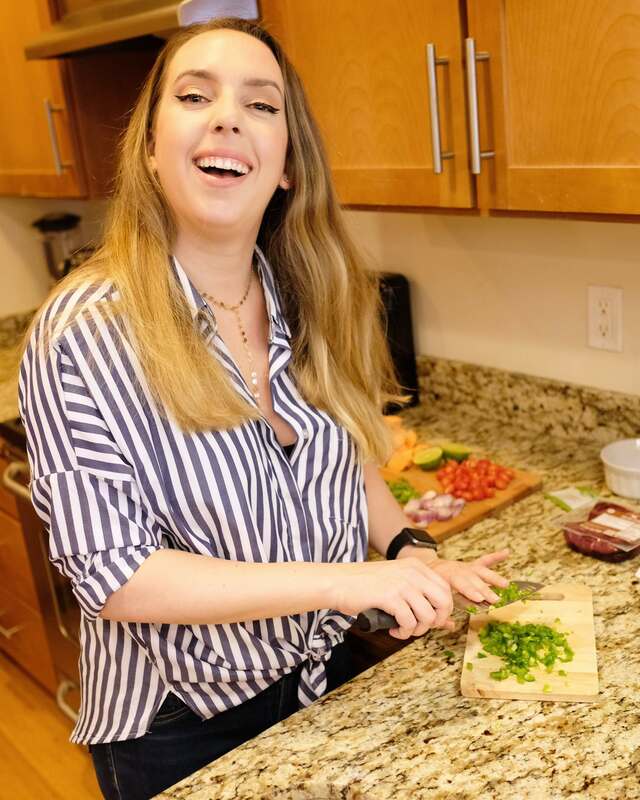 Last month I got to try the meal kit delivery service and it was seriously so convenient, and most importantly tasty! The 3 recipes I had were the Argentine Chimichurri Steak, Balsamic Fig Chicken, and Shake It Up Pork. The first thing to note is that HelloFresh is customized to your needs. Whether you’re a family of 2 or 4, need vegetarian or prefer specific protein options, HelloFresh has something for you. They source quality ingredients from trusted suppliers, with an emphasis on seasonal flavors and sustainability all the way down to their packaging. Ingredients are clearly labeled for each recipe, and the only extras you may need to have in your kitchen on standby are salt, pepper, butter, and olive oil. We are a household of two busy working professionals who live in the city, with not a lot of time or even counter space to give. 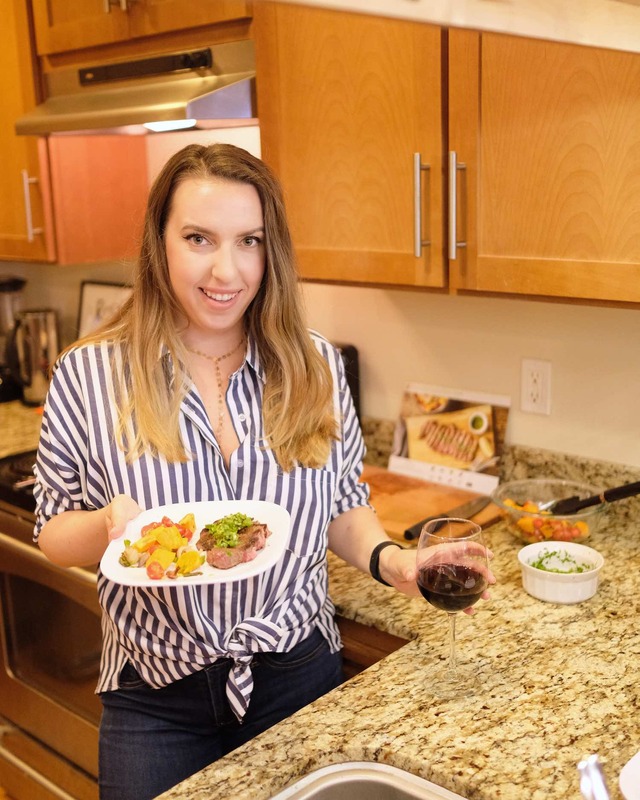 Each of the three HelloFresh recipes we made were done in under 30 minutes, with straightforward steps anyone can follow. Ingredients are measured in exact quantities, sometimes with a little more in case you enjoy extra herbs or spices like garlic or cilantro. All you have to do is wash and chop! 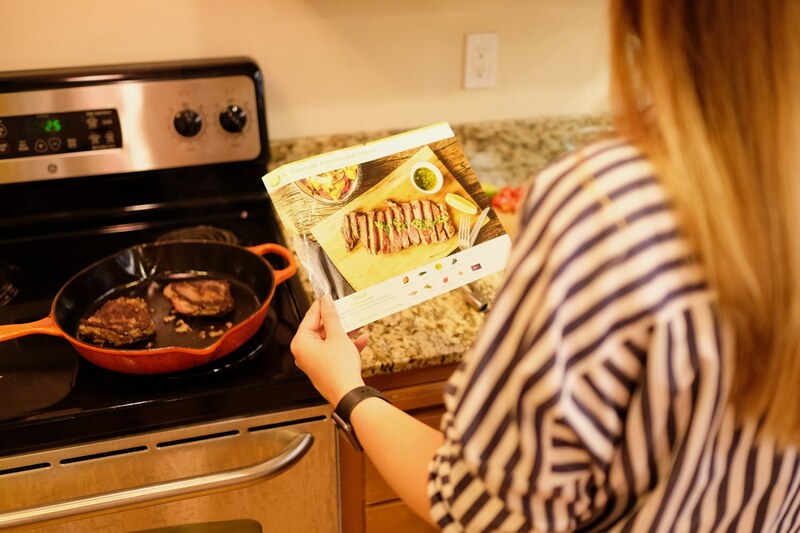 What I also love about HelloFresh is that it’s like a mini cooking lesson. 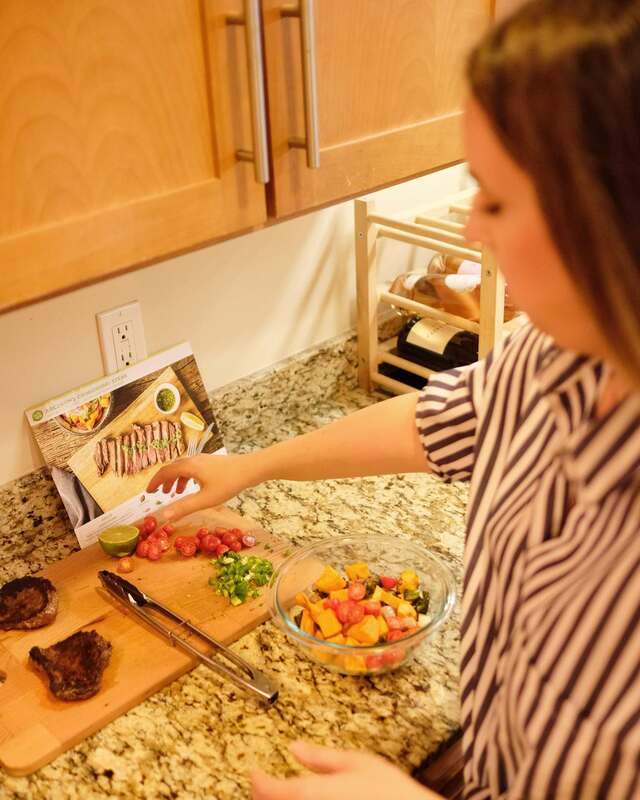 Each recipe card explains the recipe from start to finish, including suggested dishware, utensils, and wine pairings. Photos illustrate step by step preparing, cooking, and plating. The chimichurri sauce and balsamic fig glaze I made a few weeks ago with my HelloFresh meals are some of my new go-to sauces I can quickly whip up. 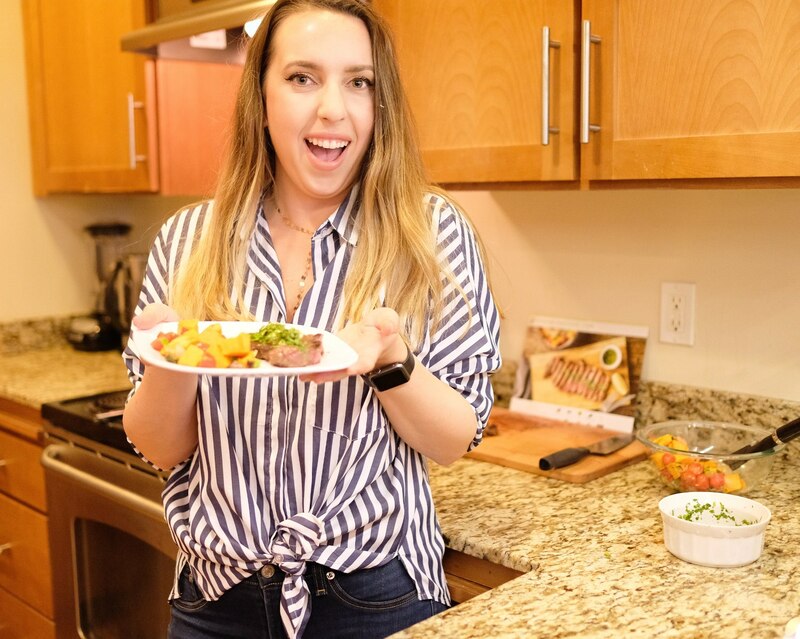 HelloFresh allows me to have a healthy and home-cooked meal without the guesswork, and that’s why I’d recommend it to anyone who could use some extra convenience in their life. If you sign up with my link and use code CHELSEARPEARL you’ll get 50% off your first week! Shipping is always free and you can customize your subscription to best fit your lifestyle. With my discount is comes to an unbeatable price of $5 per person per meal, under the Classic Plan with 3 meals for 2 people. What are you waiting for? Bon appetit! Always wanted to check out Hello Fresh! Looks like a great way to eat healthy with not alot of time. We love Hello Fresh. The meals were so easy to make, healthy and were done so quick! I’m glad you guys liked it too! I love that the recipes come with color pictures. This would be a great way to learn some new recipes. yummm… i find it so hard to make healthy and satisfying meals during the week, i love finding new recipes that cut my time in half so i can actually enjoy my evenings! This look healthy and tasty too. And also it saves a lot of time. I LOVE HelloFresh! Hubbs and I used their services for awhile. I want to get back into it for sure! I have heard so many great thing with Hello Fresh but have never ordered. You have inspired me I need to make my first order soon looks like a great deal and option. My husband and I keep talking about trying Hello Fresh. Maybe it’s time! I used a similar service and the portions were so odd. I keep seeing and hearing really great things about Hello Fresh. I will definitely look into it. I can see how Hello Fresh would be a vital time saver for a busy family! Plus, the recipes look healthy as well as delicious! Great post and photos. I don’t think I’ve ever heard of the Meal Kit Delivery Service. I know I would love the Argentine Chimichurri Steak. You had me sold at done in under 30 minutes! Not having to worry about having any of the ingredients is a plus. I LOVE Hello Fresh! I think their recipes are so good. Oh I’ve never heard of this before! Maybe I’ll get this for my Mom and sister for Mother’s Day! Thanks for the review! Hello Fresh is a life saver! They have some of the best meals and they make things so much easier too. It’s the best ever! I’ve never tried Hello Fresh. This recipe looks really good. My husband and I love cooking steaks. This sounds like a great service! That’s good to hear that they cater to specific needs too. I’ll have to look into this! This sounds like a great subscription service. I will check it out! 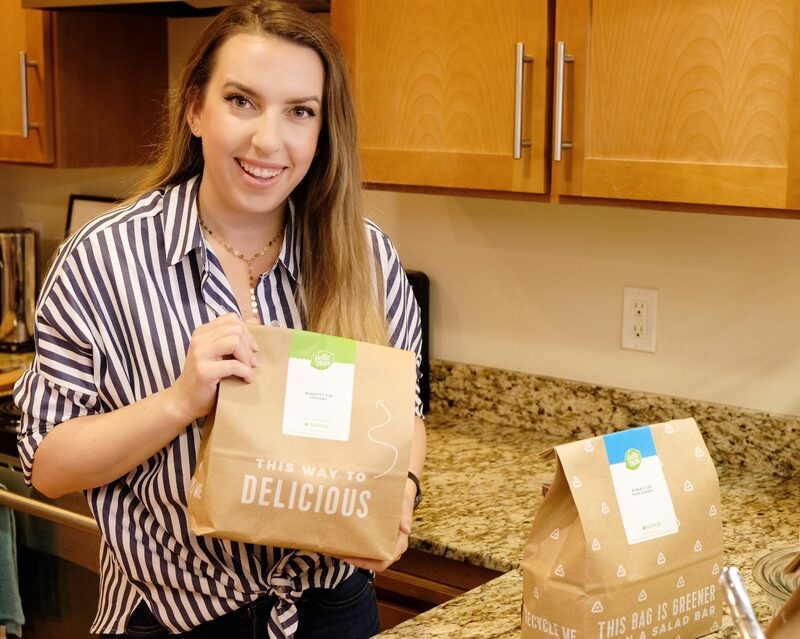 I have tried a lot of meal plans, but not hello fresh! This looks delicious! I love Hello Fresh! My husband really likes the photos and step by step instructions. It gives him a chance to cook and feel like a chef. This subscription is so cool, and my Mom would like it. I wonder why we don’t have this here in Manila. We are so left-out!